As I won´t have much time to post here on a regular basis in the next couple of months, I´ve decided to close up shop for the time being. Please check back some time in September, dear readers. Here´s to a long hot summer... Cheers! Welcome to Grab Bag, that weekly roundup of songs that got a lot of airplay here over the past week. And what have we got for you this fine Friday night? Tom Waits of course, as I´ve got my tix for his July concert in Barcelona, plus a great Waits cover by the one and only Lydia Lunch. Ole Hank gets some airplay again, just because he´s the undisputed number one in my all time top ten of country artists. Saint Nick makes an appearance with a ship song, while those brilliant freakfolkers called Tunng sing a song of the sea. For all you blues lovers out there we take a look at the magnificent Skip James Today! album. And good news for the footy haters among you: the Speedtwins provide a fitting soundtrack to the upcoming European Championships madness... I probably won´t be posting here as much as I´d like to in the coming week, as we´ve got friends coming over and there´s loads and loads of football matches to be watched. Fever pitch! Bring it on. They may have been way expensive, but I´m still very excited that I´ve got tickets to see Tom Waits here this July. So let´s celebrate with a great Waits cover by no wave godmother Lydia Lunch. She makes the song her own almost effortlessly, like Tom wrote it especially for her. And those trademark semi-bored vocals crack me up every time. Find it on the tribute album New Coat Of Paint - The Songs Of Tom Waits (Manifesto ´01). "Well this stuff will probably kill you, let's do another line, what you say you meet me down on Heartattack and Vine..." And here´s the goateed master himself, live in Stockholm back in ´99. "See that little Jersey girl in the see-through top, with the peddle pushers sucking on a soda pop, well I bet she's still a virgin but it's only twenty-five 'til nine, you can see a million of 'em on Heartattack and Vine." "Bring me a song of the sea, sing me a song of the sea." Let´s stay in the briny for a bit longer with Tunng, purveyors of fine freakfolk since 2005. A gorgeous melody, with just enough electronica and samples to keep things interesting. Everybody even remotely attracted to the genre should buy their debut album This Is... Tunng (Static Caravan ´05) immediately. And as a bonus track, here´s the equally impressive Wolves by Tunng side project The Accidental. Find it on the recently released There Were Wolves (Full Time Hobby ´08). Bluestime now. Skip James made his most legendary recordings back in the early thirties. Amazing stuff, but the sound quality is hard to handle for some. That´s no problem with the best album James recorded after his rediscovery by blues scholars in the sixties. Skip James Today! (Vanguard ´65) is one of these records I can listen to almost every day. What a voice! Most tracks find Skip on guitar, like the exquisite Cypress Grove. "I will drink muddy water, I'll sleep in a hollow log, before I stay up here, honey, treated like a dog." But seated behind the piano - as on How Long for instance - the results are just as fine. If you haven´t done so already, please submit your votes over at the Setting The Woods On Fire blog. The Motor City cowboy who runs the place is on a blogging hiatus at the moment, but in the meantime he´s desperate to know your favorite country artists. Johnny Cash is currently in the lead, with Hank Williams hot on his heels. Now I love the man in black of course, but I maintain that the title should go the the father of them all: ole Hank. Here´s my all time favorite Hank Williams song, Weary Blues From Waitin´. "Oh sweet mama, please come home..." Sadness incarnate. Find it on 40 Greatest Hits (PolyGram). Tension mounts here as it´s only three days until Holland takes on Italy, the current champion of the world, in the European Championships. Its´gonna be a tough one, but I´ve got plenty confidence in the lads. Forza Olanda! For those of you who are not into the beautiful game - hey, nobody´s perfect - here´s an anti-footy song for you. All together now: "We... hate... football!" The Speedtwins were one of the first Dutch punk bands around, and this song is actually directed at the Argentinian junta that organised the ´78 World Cup. Find it on the exemplary compilation I´m Sure We´re Gonna Make It (Epitaph ´96, sadly out of print). Will Oldham a.k.a. Bonnie Prince Billy is undoubtedly Louisville, Kentucky´s finest export product since Cassius Clay. Bonnie pulls no punches either, and that´s probably why he´s an acquired taste for some. Me, I´ve been hooked on the gospel according to Oldham ever since I bought that great Palace Brothers´ debut single Ohio River Boat Song back in ´93. Bonnie does his own thing, stays independent and honest to himself, and accepts no compromise. As for the eloquence and feeling in his songs, I´d nearly call him the the Townes Van Zandt of his (lo-fi) generation. 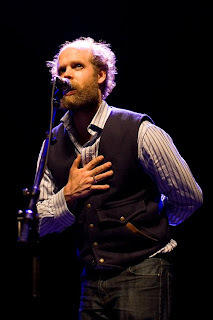 But man, I´m happy just to nominate Bonnie Prince Billy as the finest living singer/songwriter working today. Hot on the heals of last year´s intense cover album Ask Forgiveness the prolific Billy has just now added yet another goodie to his already huge oeuvre. Compared to, say, the stark and gloomy The Letting Go (´06), Lie Down In The Light is a remarkably laid back and even sunny record. Hence the title I guess. If albums can be seen as reflections of a musician´s state of mind on a given moment in time, Oldham must be quite the happy camper nowadays. To quote You Remind Me Of Something (The Glory Goes): "I like the places where the night does not mean an end, where smiles break free and surprise is your friend, and dancing goes on in the kitchen at dawn to my favorite song." I just learned that Bo Diddley died today of heart failure. Diddley was a groundbreaking genius of rock & roll who had that exciting jungle beat down pat... I´ll miss him. "Tombstone hand and a graveyard mind, just 22 and I don´t mind dying..." Bo was 79. Find Who Do You Love, definitely my favorite Bo Diddley song, on the definitive Bo Diddley: The Chess Box (Chess records). Unaware of Bo´s fate, I spent hours and hours on the phone earlier today trying to buy 2 tickets for Tom Waits´ Glitter And Doom tour. No online ticket sale here in the fair city of Barcelona, and the ticketing agency didn´t provide any pricing or floor plan details on their site either. Waits´ European tour will be subject to new anti-scalper plans, thus attempting to ensure that every fan will pay only face value (plus normal service and handling fees) for the tickets. Tickets are limited to two per person with the purchaser’s name – and name of their plus one – printed on the ticket. Ticket-holders need photo ID corresponding to the names on the tickets to gain access to the venues.